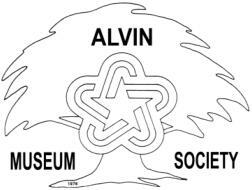 A general membership meeting for the Alvin Museum Society is scheduled for 2:00 p.m., Sunday, March 22 in the west wing of the Alvin Senior Center, 309 West Sealy. The public is invited to attend. Michael Bailey, curator of the Brazoira County Historical Museum, will discuss the origin and later stages of the Texas Navy. Mr. Bailey is very knowledgeable about this topic and will share some interesting information with us. In addition, there will be a free drawing, discussion of the Garden Tour, sale of raffle tickets for an original watercolor, refreshments and visiting. Make plans to join us for a good time on Sunday, March 22. Look forward to seeing you!! Advance ticket purchase is now available for the 10th Annual Alvin Area Garden Tour set for Saturday, April 18, from 10:00 a.m. - 4:00 p.m. Tickets are $5.00 in advance and may be bought from the Alvin-Manvel Chamber of Commerce, at drive-thru windows of Alvin's Guaranty Bank, and during open hours at Alvin Historical Museum and Marguerite Rogers House Museum. Get your tickets early! Tickets will be available on event day at each featured site for $6.00. Proceeds from the tour including the plant sale will fund maintenance of the House Museum. there is no charge for children under 12 years old.